It's that time of year again — we've got a bunch of treats for readers who want to support Techdirt while getting some new gear and perks for the holidays. Today we're happy to make three big announcements about the Techdirt Insider Shop. First, the shop is accepting Bitcoins! You can now use the internet's native currency for any purchase — just fill your cart as usual and select the Bitpay option at checkout. Second, in celebration of that upgrade and as part of the Bitcoin Black Friday event happening today, we've put a bunch of items on sale. There are savings on a bunch of Insider gear, plus big discounts on our offerings for serious fans: Lunch with Mike and an awesome day with Techdirt. Last but not least, it's time for the return of the Holiday Bundle! This year's bundle includes a pullover hoodie, your choice of a coffee mug or water bottle, and the classic logo tee in your choice of light or dark gray. 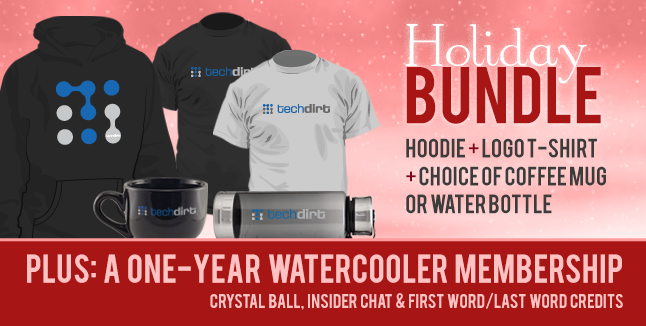 On top of that, the bundle includes a Watercooler Special: one full year of access to the Crystal Ball and the Insider Chat, plus a monthly cache of First Word/Last Word credits and an exclusive group video chat with Mike. All together this package would normally cost up to $152, but for a limited time it's available at $99! If you're ordering gear from the Insider Shop to give as a gift, please do it soon to ensure it ships in time! Unfortunately we are unable to guarantee Christmas shipping, but orders placed by December 14th (in the US) or December 9th (internationally) should arrive on time with all shipping options. Depending on your location, there may be express shipping options available as well. So, hey, remember that one time that Disney thought it'd be a pretty sweet idea to celebrate the death of Osama bin Laden by applying for trademarks on Seal Team 6's name so they could apparently sell snow globes? Pretty much everyone who came across the story dropped a verbal brick on the Mouse for what looked like quite an elegant mix of cynicism and a lack of patriotism, causing them to drop their applications shortly after. Personally, I'm having a hard time thinking of a better exemplification of what is currently the 'American way' than locking up language due to the brave actions of others, but I guess my brand of cynicism just isn't cool with the kids these days. Anyhoo, guess who now wants to lock up the name of a traditional Mexican holiday to sell some swag? Yup, Mickey is back to his old habits with multiple applications on "Día De Los Muertos", more commonly known as the Day of the Dead. Disney filed 10 requests in the U.S. Trademark and Patent Office this month to coin the phrase. Disney's filings are mainly for merchandise, presumably connected to an upcoming film. The areas they are hoping to secure include “education and entertainment services,” “fruit preserves; fruit-based snack foods,” “toys, games and playthings,” “clothing,” “footwear,” “backpacks,” “clocks and jewelry” and more. You know, as someone who likes to think they write things people occasionally find funny, I have to tell you how special it is when someone out there does all the setup work for you. I mean, a national holiday during which families come together to pray for their recently departed... and you're going to make fruit preserves and snacks about it? Seriously, I don't even have to write a joke about this. It writes itself. What are they going to call the snacks, Fruit Roll-Out Your Deads? Berry Departeds? It's a gold mine! As for the other areas in which they applied for the mark, it's worth noting that approximately an infinite number of other folks are already producing Día De Los Muertos merchandise. Note that nearly all of the markets Disney applied for are covered already, with the exception of all the fruit snacks and preserves. In the article, some helpful trademark lawyer made sure we all know that Disney getting their marks approved wouldn't mean people couldn't celebrate the holiday, because ostensibly we're all complete morons and didn't know that already. The point is that making a movie shouldn't allow Disney to suddenly lock up the name of a traditional holiday for markets that are mostly already well served by other providers. Update: And.... just like that... withdrawn.